If there’s one thing visitors to Elation Professional’s Winter 2012 NAMM display will immediately notice, it’s that the company has spread its horizons well beyond the cutting-edge, value-driven lighting fixtures it has become so well known for. Two of Elation’s most exciting and innovative new NAMM introductions are in the video realm: a unique flexible LED panel that can bend around dimensional surfaces to create curved video walls; and a DMX-512 moving head video camera that can project images of people and objects in a room or dance floor onto a video wall or TV. Also new and on the “edge” – quite literally -- is Elation’s easy-to-use RGB LED pixel tape, which can be affixed to the edges and surfaces of any object in moments to highlight it with a dramatic border of changing colors. 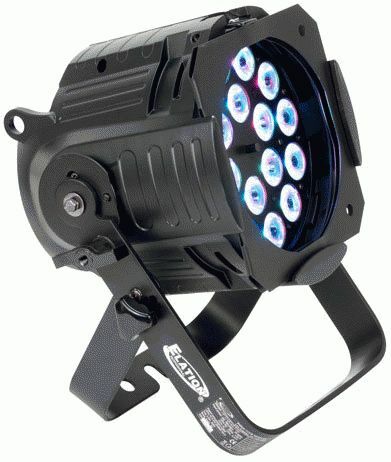 As far as lights themselves go, Elation will be showing plenty of remarkable fixtures too, like the Opti QA Par, an RGBA color-mixing LED par can that features the company’s exclusive Quad Color Technology, in which four colors – red, green, blue and amber are combined into each LED source for superior color blending. 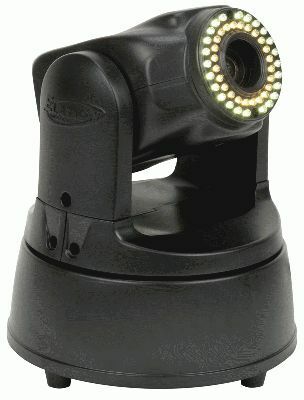 EVCMH Moving Head Video Camera – The EVCMH is a unique DMX-512 moving head video camera designed to spotlight almost anything and project it onto a video wall or TV. Great for weddings, corporate events, dances, and nightclubs, it features DMX-512 controllable pan/tilt, zoom and focus, allowing it to “capture” almost any person or object in a room, dance floor or exhibit. Featuring 48 warm and cool white LEDs (24 of each), it allows you to customize its shade of white to work with different skin tones and ambient light – ensuring that it will always project the best image. When used with media software such as Arkaos Media Master Express, Grand VJ or Madrix, stunning effects and visuals can be created. The EVCMH camera’s features include: 60° beam angle, 8 DMX channels, dimmer, estimated 50,000 hours LED life, 5-pin XLR in and out, 36-watt power consumption. EPV15 Flex Video Panel – When it comes to video walls, you no longer have to tow the straight and narrow (or straight and wide) – thanks to Elation’s new EPV15 Flex flexible LED video panel. Designed for creating curved video walls, the EPV15 Flex features an innovative Easy Flex Design that allows the panels to bend, coil and wrap around any surface, whether flat or dimensional. 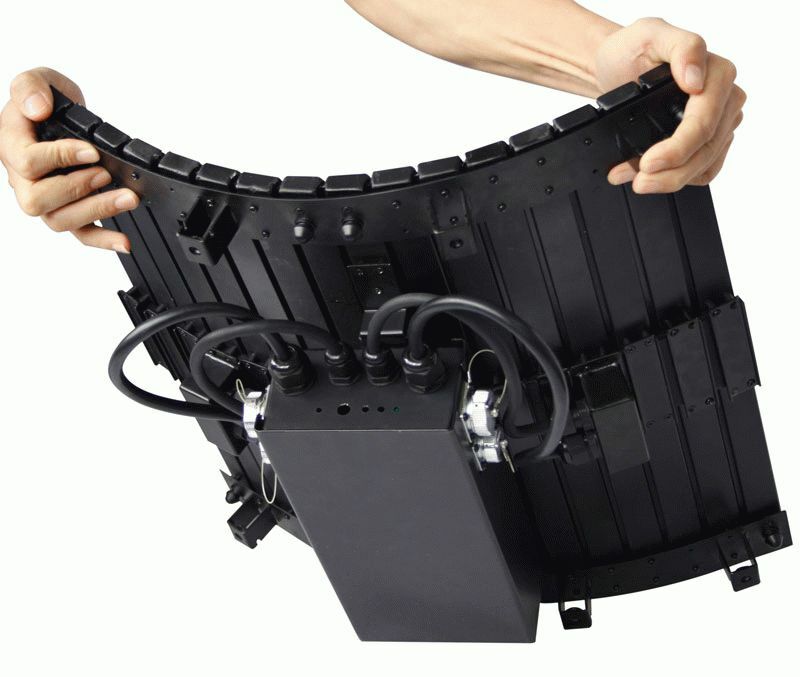 With its ability to adapt to curved surfaces and high ingress protection ratings of IP65 (front) and IP54 (back), the EPV15 Flex makes it possible to install a high-impact video wall anywhere -- indoors or outdoors –in spaces of any shape or size. Utilizing three-in-one RGB SMD LEDs, it features a 15mm pixel pitch, 4,500-nit brightness, and 12m minimum viewing distance. Each EPV15 Flex panel measures 19.2” x 19.2” (480mm x 480mm) and includes its own built-in PSU 100V-240V power supply. Flex Pixel WP Tape – Add glowing accents of color anywhere – on signs, stages, walls or furniture – quickly and easily with Flex Pixel WP, an RGB LED Pixel Tape. 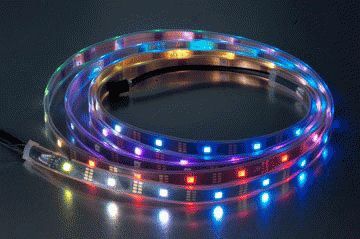 This thin and flexible LED circuit strip features an adhesive backing and comes in 10’ spools of 70 RGB pixels each, which can be cut into strips of desired length, then “taped” onto virtually any surface. Wherever it’s used, its waterproof covering will keep it high and dry and protected against moisture. It’s easy to create dynamic lighting programs, too, using the optional proprietary Flex Pixel Driver 1, which can drive up to 140 pixels (2 tapes), and optional Flex Pixel IRC Driver and Wireless Remote. Also available is an optional 5V DC power supply, the Flex Pixel 5VPSU. Opti QA Par – This compact, energy- efficient color-mixing par is powerfully bright, thanks to its 18 x 5-watt RGBA LEDs, yet it draws only 140 watts of electricity at maximum use. Its advanced Quad Color Technology, which combines red, green, blue and amber into each LED source, provides superior color blending and eliminates the annoying shadows often produced by fixtures with single-color LEDs. Its use of amber LEDs, rather than white, is ideal for applications where warmer, richer blended colors are desired. Featuring DMX or manual operation, the Opti QA Par includes dimming, strobing, and a standard 10° beam angle. Great for stages, clubs, and uplighting, it comes equipped with a split yoke bracket that allows it be set on the floor or mounted on a wall or trussing. Its long-life LEDs will run for 50,000 hours without burning out. Also included are power-con in and out, 3-pin and 5-pin XLR connectors, and an electronic power supply.